Bell clocks initiate shift changeovers of duty watches. The strikes of the bell indicated the time at sea. Back in the day, sailors like Christopher Columbus and his crew used sand clocks made from glass, so-called hourglasses. There are thirty minute hourglasses and fifteen minute hourglasses. Duty began and ended at eight strikes. The counting method back then ended at eight and WEMPE decided to manufacture 8-day-bell-clocks as a reminder of times long past. The German training ship Gorch Fock still teaches its students this rhythm. WEMPE bell clocks are available in various series, all with battery-powered quartz movement and with either Roman or Arabic numerals. 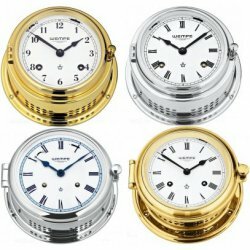 Whether chrome plated or colourlessly lacquered and high-gloss polished brass - mechanical WEMPE bell clocks are used all over the world and perfectly fit the interior of ships and yachts.